Ver . te . bral - Concerning the vertebral bones of the spine. Sub . lux . a . tion - Less than a complete dislocation of a joint with nervous system interference. Com . plex - More than one part. Click here to view a larger image of the Nervous System Function illustration, located to the left. (Neuropathophysiology) Improper spinal function can choke, stretch, or irritate delicate nerve tissue. The resulting nervous system dysfunction can cause symptoms elsewhere in the body. (Myopathology) Muscles supporting the spine can weaken, atrophy, or become tight and go into spasm. The resulting scar tissue can change muscle tone, requiring repeated spinal adjustments. (Histopathology) A rise in temperature from an increase in blood or lymph supply can result in swelling and inflammation. Discs can bulge, herniate, tear, or degenerate. Other soft tissues may suffer permanent damage. (Pathophysiology) Bone spurs and other abnormal bony growths attempt to fuse malfunctioning spinal joints. This spinal decay, scar tissue, and long-term nerve dysfunction can cause other systems of the body to fail. Like dominoes that fall in a chain reaction, problems that are left uncorrected can cause other parts of your body to not work as intended. A subluxation, or more precisely, the Vertebral Subluxation Complex, describes what happens when spinal bones lose their normal motion or position from stress, trauma or chemical imbalances. Automobile collisions, improper lifting, drugs, alcohol, emotional stress, chemical imbalances, and long periods of sitting can all cause the Vertebral Subluxation Complex. 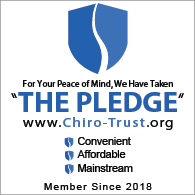 Instead of just treating your symptoms, your chiropractor is primarily interested in detecting, reducing, and correcting the Vertebral Subluxation Complex. Dvorak and Dvorak, M.D.s, Manual Medicine, Thieme-Stratton, 1984. Gray, H., Grays Anatomy; Anatomy of the Human Body, 30th edition, Lea and Febiger, edited by Charles Mayo Gross, M.D., Philadelphia, 1989.